– Sotheby’s Evening Sale of Master Paintings on 30 January will offer one of the most important work s by 18 th -century French artist Elisabeth -Louise Vigée Le Brun ever to appear at auction. Offered with an estimate of $4/6 million, her life -sized Portrait of Muhammad Dervish Khan will headline The Female Triumphant – a group of masterworks by trailblazing female artists of the Pre -Modern era, being offered across Sotheby’s Masters Week auctions this January in New York. 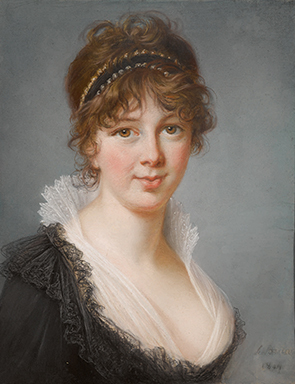 As the most widely -recognized female French artist of the 18th century, Vigée’s popularity has prop elled in recent years, most notably as the subject of a blockbuster exhibition at the Grand Palais in Paris and The Metropolitan Museum of Art, New York in 2016. A precocious and talented artist from a young age, she succeeded in gaining entrance to the Académie de Saint -Luc at just 19 – a remarkable accomplishment for a woman at the time. By the late 1770s, her reputation as a painter had become well established, as she was commissioned to paint a portrait of the young Queen Marie Antoinette. The tremendous success of this portrait led to a number of royal commissions and the continued patronage of the Queen and her circle. It was this special Royal connection that granted Vigée the ability and power to capture the portrait of Muhammad Dervish Khan, a Muslim ambassador from India, which stands today as a symbolic testament to the relationship between Pre -Revolutionary France and India. In July of 1788, Tipu Sultan, the powerful ruler of Mysore in southern India, sent three of his ambassadors to France to seek the support of Louis XVI in his goal of driving the British out of India. The French had militarily supported Tipu in the early 1780s, in his quest to resist British colonialism and the British East India Company – but after the American Revolution , France signed a peace treaty with England and retreated from India. Eager to re -engage the French both militarily and commercially, in 1786, Tipu began planning the delegation to France, in which he would ask for the support of Louis XVI and the French army and woo them with commercial goods to bring French artisans back to the Mysore Court. The three ambassadors led a grand and impressive embassy, causing a sensation in Paris as they made their way to Versailles. Most Parisians had never seen a person from India, much less Mysore, and local newspapers like the Journal de Paris reported on the ambassadors’ whereabouts almost daily. They attended plays and operas, toured French silk and wallpaper factories, and did not shy away from romances with local wom en. 3 By 1788, Vigée Le Brun’s fame and influence was flourishing – she had been painting Marie - Antoinette for a decade and was well -ensconced in the powerful elite of Paris and Versailles. When the artist saw the ambassadors at the Opera, she knew she had to paint them, as she wrote her in memoirs : “I saw these Indians at the opera and they appeared to me so remarkably picturesque that I thought I should like to paint them. But as they communicated to their interpreter that they would never allow themselve s to be painted unless the request came from the King, I managed to secure that favour from His Majesty.” As Muslim men, the idea of having themselves represented pictorially – let alone by a female artist – was unheard of. Vigée’s tenacity and resourcefulness in achieving the sitting was a remarkable feat. After the request came from the King, they agreed to sit for her at their hôtel in Paris. The intensity in which Dervish Khan is portrayed is unlike any other portrait by Vigée, whose oeuvre tends more towards a sympathetic portrayal of handsome and elegant royal courtiers. The life-size portrait is an extraordinary reflection on a French woman’s perception of a powerful Indian man, painted with exceptional skill and delicacy. Dervish Khan is imposing and formidable, clutching and displaying his curved sword, showing off his power both physically and culturally. He wears the traditional costume that so enamored the French men and women who encountered his embassy and were fascinated by the fabrics whic h were making their way into French fashions. Vigée’s decision to focus the painting on Dervish Khan’s luxurious clothing brings a feminine note to the otherwise very masculine painting and provides an interesting commentary on French fascination with exotic goods and luxury fabrics from outside the continent. When the paintings had finished drying, Vigée sent for the works but was refused – Dervish Khan had hidden his portrait behind the bed. As Vigée enthusiastically wrote, she strategically convinced his servant to steal it back for her, only to later hear that Dervish Khan had then planned to murder the servant for this transgression. Luckily, an interpreter convinced the ambassador that murdering your valet was not acceptable practice in France, and he falsely claimed that it was the King who wanted the portrait . The painting, along with that of Dervish Khan’s fellow ambassador Osman Khan, was exhibited at the Salon of 1789 in August and was received by the public with immense curiosity and critical acclaim. Two months later, Vigée had fled Paris in fear of her life after mobs had invaded Versailles. Given that the painting next appears in 1841 in the estate sale of her husband, Jean -Baptiste Pierre Le Brun, it can be assumed that she kept the work in her personal collection but left it at home in France when she went to Italy. The painting was featured in the family collection of Louis -Alexandre Marnier Lapostolle, the founder of the orange -flavored liqueur Grand Marnier for over a century, before being offered by the present owner. Elisabeth-Louise Vigée Le Brun, Portrait of Mrs. Spencer Perceval, née Jane Wilson (1769-1844), Bust-length, signed and dated lower right: LeBrun / 1804, pastel on paper, 19 by 14 3/4 in. ; 48 by 37.5 cm. Estimate $150/250,000. Courtesy Sotheby's.